Pasta salads tend to get a bad rap, but I find that the more I think of them as cold and fresh summer dishes and the less as mayo-laden bowls of suspicious ingredients offered in delis around the country, the more inviting they become, not only for picnics and potlucks but for an awesome Friday night. 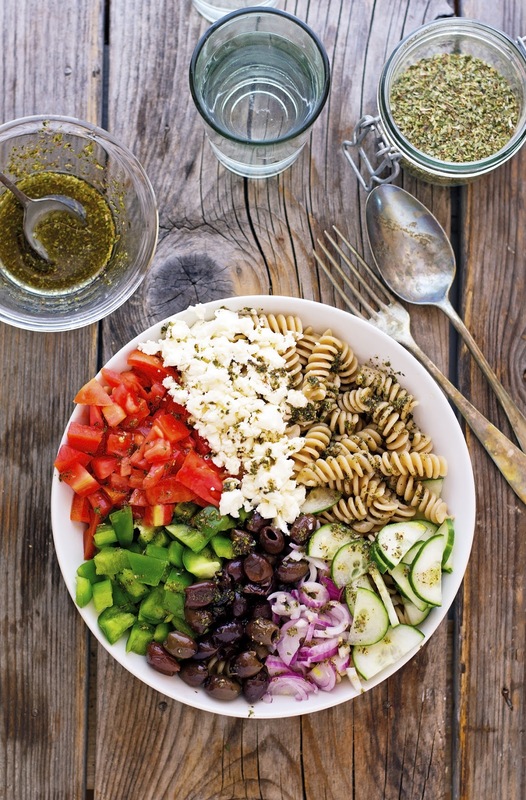 I actually made this Greek Pasta Salad for a BBQ this past weekend, everyone raved about it, and wanted to know how to make it. In my book, I always know that something works when people ask for the recipe. Then again, I’m not sure if they are ever going to make it but sure enough, they’ve enjoyed it. I love when people get so excited about something that is so simple to make and so fresh. 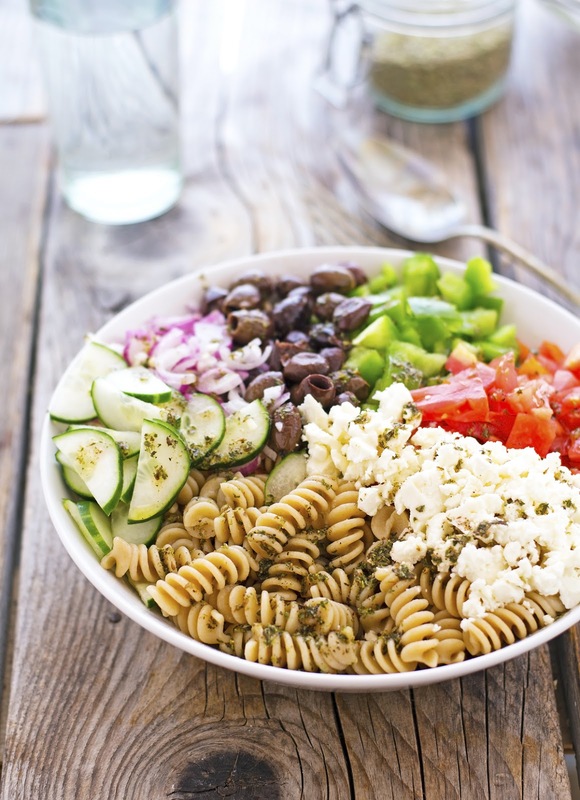 This pasta salad is a flavor-packed medley of crisp veggies, al dente pasta, salty and creamy feta cheese, and a sweet and tangy vinaigrette. And it all comes together in a matter of minutes. If you want to add some protein, you can throw in some souvlaki chicken. Trust me, you won’t be disappointed. 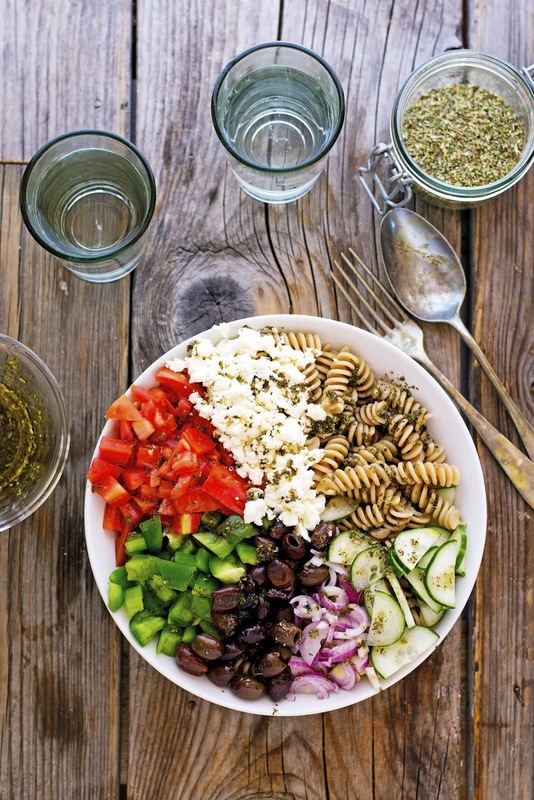 You can use whatever pasta you want in this Greek Pasta Salad. I love rotini because it’s fun to eat and I also love the way the dressing gets caught in the crannies and infuses the pasta with flavor. This red wine vinaigrette is so simple, flavorful, and it comes together in a matter of minutes with just a few pantry ingredients. It’s the perfect dish for taking to parties, potlucks, BBQs and more. This pasta salad goes well with so many different things. It’s basically summer in a bowl: colorful, fresh, and healthy. Cook pasta in a large pot of boiling salted water according to package directions. Drain, and run under cold water to stop the cooking process. Drain again. Transfer to a large bowl and toss with 1 tablespoon of olive oil. Add cherry tomatoes, bell pepper, cucumber, olives, onion, and feta. Mix to combine. In a small bowl combine all dressing ingredients and whisk together well, or put in jar with lid and shake well. Pour over pasta salad and toss to combine. One serving yields 354 calories, 16 grams of fat, 45 grams of carbs, and 9 grams of protein.